The picture was clicked at the Beacon Rock Golf Course in Oregon. Who knew people were this committed to a game of golf! 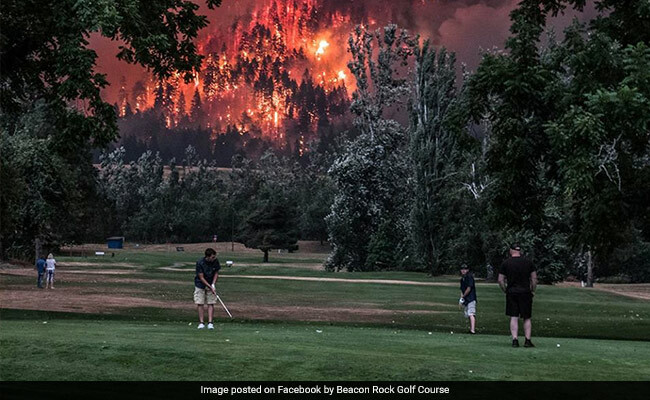 A startling picture of a bunch of golfers in the US, continuing with their game even as a wildfire raged behind them, has taken the Internet by storm. While on Twitter the picture has collected a whopping 2.2 lakh 'likes' and more than 1.1 lakh retweets, on Facebook it has received over 1,400 shares, all since September 7. The picture was clicked at the Beacon Rock Golf Course in Oregon and first stunned users of Reddit. It was later shared on the official page of the golf course and by journalist David Simon. While the picture has gone crazy viral online, many have asked if it was Photoshopped. Beacon Rock Golf Course have claimed it isn't and now the photographer behind the picture has also confirmed it's real. The photo was actually clicked by 'novice photographer' Kristi McCluer, reports OregonLive.com. "It's a real photo," she confirmed, adding that she did lighten it a little. Ms McCluer first saw the fire in Eagle Creek on September 2 while skydiving, reports Fortune.com. A couple of days later she was out on a drive with her camera when she spotted the sight and captured pictures. "The golfers and I were not actually in any danger," Ms McCluer told Fortune.com. Here's another photo posted by the golf course on Facebook. The Eagle Creek Fire, ablaze in the Columbia River Gorge, has spread across 33,000 acres and forced the evacuation of many. This isn't the first time a picture like this has gone viral. In June, a picture of a man in Canada mowing his lawn while a scary tornado swirled right behind him took social media by storm.